The Atom hooded jacket from Icebreaker is a technical merino wool mid-layer, featuring a full length zip and thumb holes, as well as zipped hand pockets and an upper-arm pocket to store your essentials. 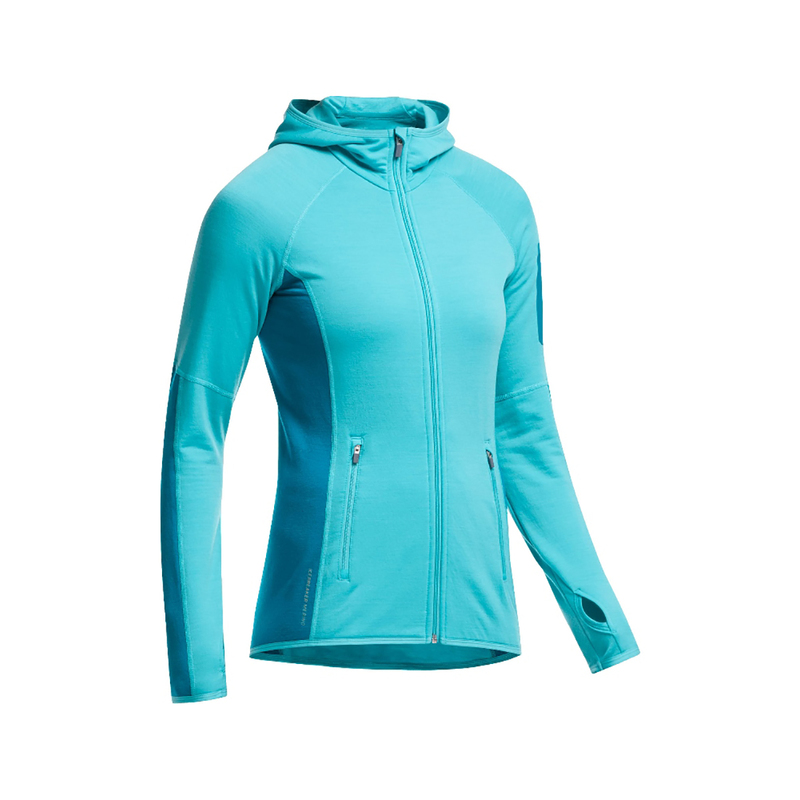 With a slim, women's-specific fit, this mid-layer is designed to move with you and be comfortable when worn in combination with other technical garments. Supreme thermal isolation is achieved thanks to the use of the RealFLEECE® fabric. 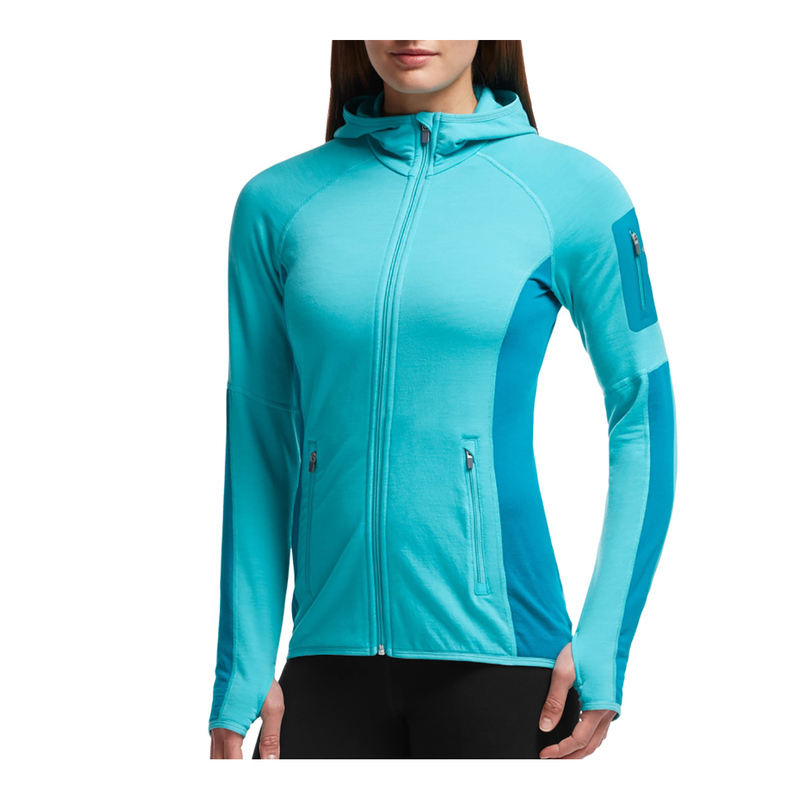 The Atom is an ideal garment for skiing, climbing in cold weather conditions, or any other winter pursuit. Weighing in at 200g/m2, this is Icebreaker’s lightweight merino that’s used to make their base and first-layers. Garments of this weight perform well when worn on their own in cool weather, but can also be layered up in colder temperatures. 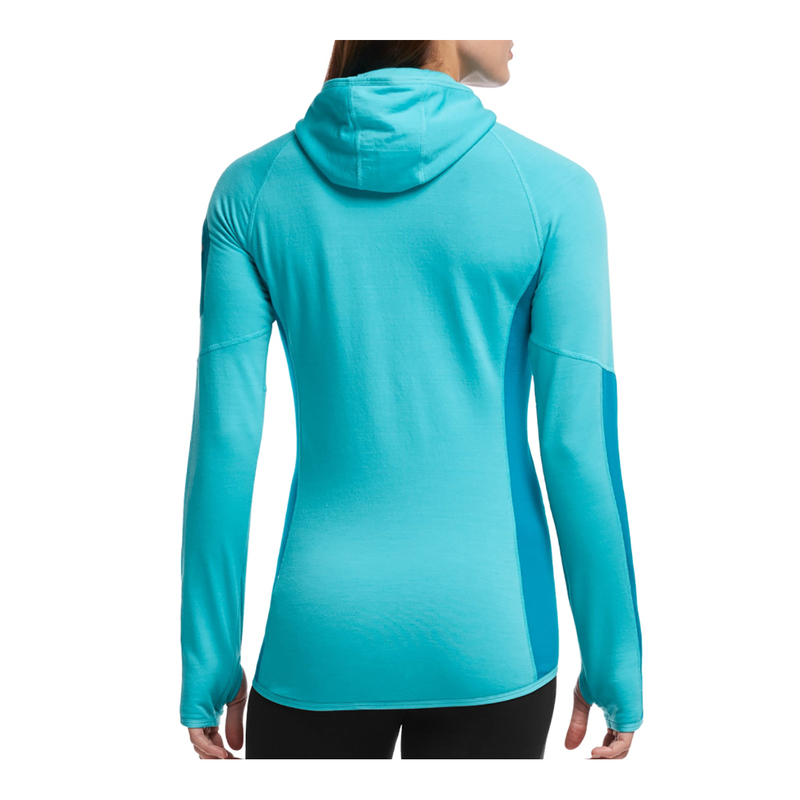 They’re ideal to wear for cold-weather training or as snow-sports base or mid-layers. Icebreaker’s RealFLEECE range is built to be extra strong, extra warm and extra soft. Threads are made using merino fibres to coat a strong, durable Nylon core, which is then woven into a fabric and brushed become super-soft. Brushing massively increases the thermal retention of a fabric, meaning RealFLEECE garments provide more warmth (and more durability) for less weight. Merino wool is a unique type of wool hailing from the merino sheep, and has been a landmark fabric for many a specialist brand. Merino fibres are smoother, softer and lighter than those of standard wooly-jumper wools, which makes them super thermally efficient. They also have a natural crimp which means more air pockets for warmth and breathability, plus merino is naturally antibacterial, so it won’t stink after one afternoon on the mountain. Merino also contains Keratin, which is scientifically proven to be really good for your skin, making it one of the best base-layer and underwear materials around. It’s generally more expensive than the equivalent polyester, but is often worth the extra dollar. All Icebreaker merino wool is responsibly sourced from New Zealand, then processed, dyed and packaged using recycled water and materials, as well as eco-friendly dyes.